Thinking about quitting your current job? Learn how to write a resignation letter or use one of our templates below! The below sample library was designed by our in-house Resume Genius writing team and HR consultants. Explore and download any of these templates for free and leave your job on a professional note. We decided to include even more free samples due to popular demand. We have built out seven new career-specific templates to help match your needs. Remember to modify these downloaded files to match your circumstances accordingly. No matter if you are a recent college graduate or senior executive, sometimes personal issues suddenly arise that force us to resign. It can be hard to write these letters due to the personal stakes involved – the resignation letter templates below can help. Whether you are departing a company on good terms or can’t run fast enough out the door, it may be wise to write a letter of resignation. This type of document formalizes your intention to leave the company and the reasons for your departure. Following these writing tips will smooth out the process of leaving. Why Should You Write One? A resignation letter is an efficient way to send the same document to numerous departments keeping all relevant parties well-informed of your departure. If the document is polite and straightforward, your manager will be impressed with the gesture and quite thankful for this information. So long as it is constructive, it may even bring intangible benefits to your career down the road, such as potential letters of recommendation, positive appraisals via word of mouth, and may even help you return to the company. When Should You Write One — Months in Advance or Two Weeks Notice? How Should You Submit Your Letter? You can have a private meeting with your manager where you share your plans, followed by a formal letter to make it official. In the end, do what you feel comfortable with. Make sure that your exit is known by all key stakeholders, including your manager, and HR. You need to take the initiative to communicate to each department, so don’t assume everyone will be on the same page. Include the date when you submit the letter in the top left line above the address. The address should follow a formal business letter template. Use the company name on the first line, followed by the street address, city and zip code. The addressee is usually your manager – you can use their first name. If the situation calls for it, you can address a larger audience such as unit, team, department, or the whole company. You must make it clear that you are resigning from the first sentence. A clear departure date is necessary as it lets your manager strategize the path forward. In this section, employ your diplomatic chops and provide a reason for your departure. Acceptable reasons can range from general health concerns, spending more time with family, relocation, career change, and much more. Keep in mind that this document is usually not the best method to express dissatisfaction with your company. You can metaphorically nail 95 grievances to your boss’s desk by detailing areas of urgent reform but think hard about the pros and cons of delivering such a letter. Make sure to end the letter by thanking your manager and if you feel grateful, acknowledge the opportunity they gave you. If you submit a hard copy of the letter, sign above your typed name. A typed name suffices as an online resignation letter. 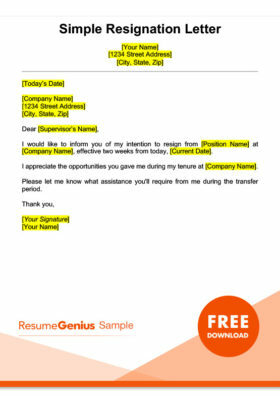 If you are resigning and a seeking a job, check out our popular resume builder. A letter of resignation is a functional document that can be used in many exit situations. Usually, the document signifies that your time in the position will come to a close in the coming days. Be prepared for all situations and tailor your letter to match the situation. Thanks for your comment, we’re happy you’ve found our content of use! Hope our resignation letter samples were able to help. Best of luck! Thank you for freely offering me a simple guide to a very simple letter of Retirement from this company. It’s just what I was looking for & met my needs nicely over my lunch break, after which I will present my letter to my Manager. Happy to hear that our guide helped you! Hope your resignation went well.